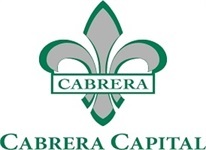 Cabrera Capital Markets Public Finance group is committed to creating and implementing cost effective financing solutions for our state and municipal clients. Our experienced professionals are dedicated to finding ways to make the job of government finance professionals easier and we stand prepared to leverage our resources to support transactions that will lower the cost of public infrastructure. Cabrera's Public Finance team of highly experienced, dedicated professionals possesses a thorough understanding of debt finance and management from the issuer's perspective. We are fully attuned to our clients’ current needs and strive to anticipate their future challenges.